Create a data-driven bot that responds to user input. Imagine your “bot” living on a cloud web server. A user visits a URL on that server, the server sends a message to your bot program, your bot does something. Deploying this bot will probably involve you learning Flask and Github and also remember how to SSH into a remote server (or maybe use Heroku). Don’t worry, it’ll be fun. I actually prefer you put the code folder up as a Github repo, but if you run into a hiccup, you can email me for now. The README.md file is a 600-word writeup of why you designed your bot to do what it did. Describe the data-finding/wrangling process, including any limitations. Please include links to any stories or other projects from which you drew inspiration. The two library scripts don’t have to be named that. but think of those scripts as the ones in charge of the two different datasets that you’re using, including the downloading/parsing, etc. Your bot.py script should be importing the necessary functions from library_1.py, etc., so that you aren’t writing a gigantic script. You should plan on your bot returning a string, like a HTML string (which I’ll get you up to speed quick). Unless you’re doing something crazy, like producing a picture. 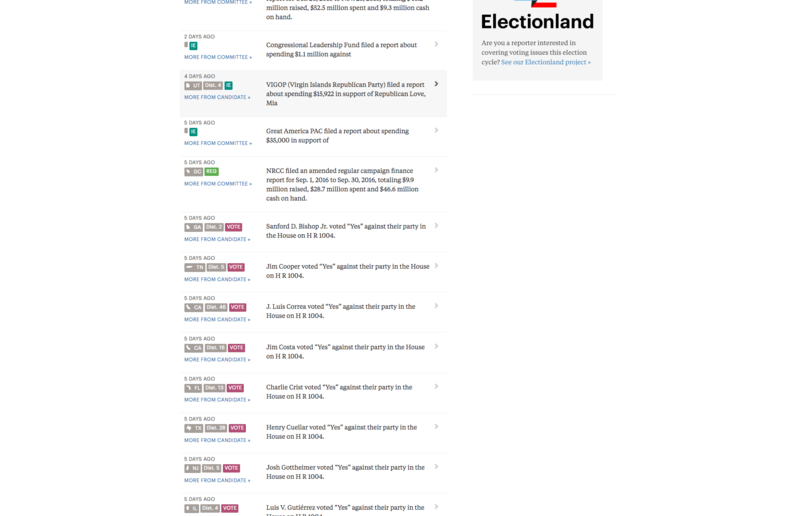 Accepts at least one argument from user input, such as user-location, name, date, zip code, age, etc. Draws from at least 2 sources of data. Outputs a message or “story” that reflects a filtering/transformation of the data. This is where things get a little bit tricky. After you make sure your bot works on your own computer, we’ll put it up on a cloud server. To keep things simple for this first bot, we’ll assume that it works off of a trigger. And that trigger can be as simple as visiting a URL. 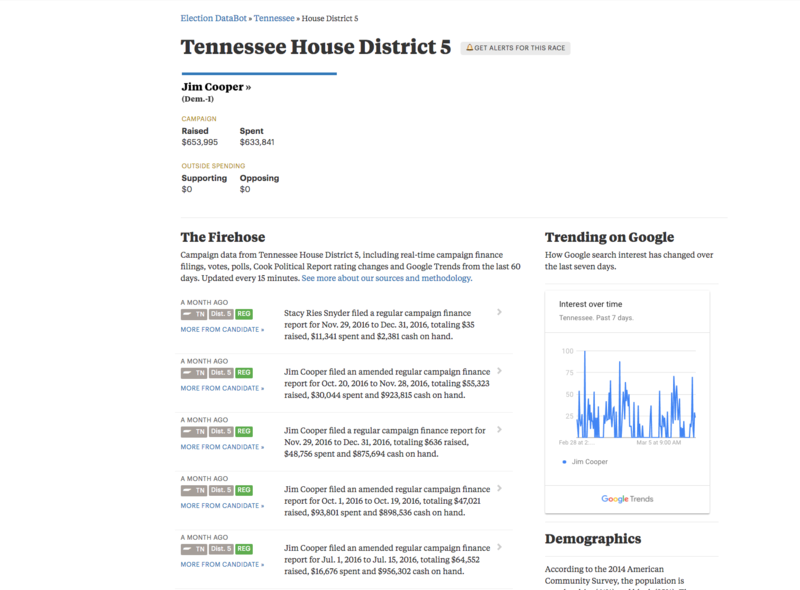 Look at the URL, in which TN and 5 are provided as arguments, and we get data/stories focused on Rep. Cooper. So your bot will live on a web server. At the very least, it’ll post some HTML. You can make it fancy if you want. Or, you could have that web trigger make the bot send a text message or tweet. Up to you. © Copyright 2017, Dan Nguyen.